In a fit of I-don’t-know’what I bought a package of hazelnut meal (actually labeled Natural Ground Filberts) last Passover, and never used them. So when I saw this recipe in the New York Times I was thrilled. It was part of a fruit cobbler recipe (this was the topping) – and I’m sure that would be yummy, but I tried them without the fruit, as biscuits for breakfast, spread with butter and marmalade and served with scrambled eggs. They were deelish! I used milk instead of cream with no ill effect. 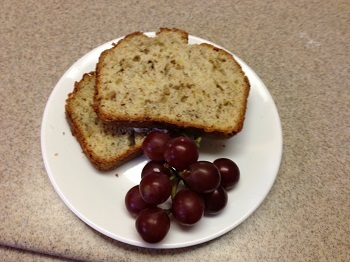 And the recipe would probably work just as well (though taste a little different) with almond meal instead of hazelnut. In a small skillet, cook the hazelnut meal over medium-low heat, stirring constantly, until golden brown and fragrant, about 3 to 5 minutes. Transfer to a plate and let cool completely. Combine cooled hazelnut meal, flour, sugar, baking powder and salt in a large bowl and whisk to combine. Cut butter into flour mixture with a pastry blender or two knives (or your fingers) until the mixture resembles coarse meal with a few pea-sized pieces. If the butter starts to get warm, put the bowl in the fridge for a few minutes. In a small bowl, combine the cream and milk and quickly stir it into the flour mixture with a fork. Do not overwork the dough. Drop the dough in 8 to 10 mounds on a baking sheet. Brush the tops with cream and sprinkle with a little sugar. Bake about 15 minutes, until lightly browned. I can’t give credit where it’s due because I can’t remember the publication from which I clipped this lovely recipe. I made it for a potluck a few months ago and it went over really well. 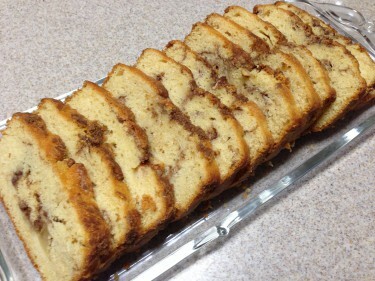 In looking for a photo, I noticed I posted a similar recipe, Apple Dapple Cake, last August. This one is less sweet and doesn’t include nuts. Grease and flour a 9 x 5 inch loaf pan. Mix brown sugar and cinnamon together in a bowl and set aside. Beat white sugar and butter together in a bowl using an electric mixer until smooth and creamy. Beat in eggs, one at a time, until incorporated. Add vanilla and mix in. Combine the flour, baking powder and salt in another bowl and stir into the butter mixture. Add milk and mix until smooth. Pour half the mixture into the prepared loaf pan. Add half the apples and half the brown sugar/cinnamon mixture. Then add the rest of the batter, the rest of the apples and the rest of the brown sugar/cinnamon. Lightly pat the apples into the batter and swirl the brown sugar mixture through the apples with a finger or spoon. Bake about 45 minutes until a toothpick inserted in the center comes out clean. Cool in pan for 10 minutes, then remove and cool on a wire rack. Cool completely before slicing. I’ve been getting requests for Passover recipes. This isn’t one. The problem is I like to include photos with my recipes, and I won’t be making any Passover recipes for another 10 days when my kitchen is ready for the holiday! I’ll look for year-round recipes that also work for Passover to post soon, and once my prep is complete, I’ll post some of my fave Passover dishes. Meanwhile, look in your freezer — maybe, like I did, you have a package of fresh cranberries stashed there. This would be a great way to use them up before the holiday! This recipe came from one of our neighbors – I can’t remember which one – in the graduate student apartments at Temple University where we lived from 1972 to 1976. 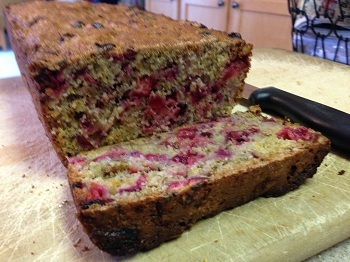 I’ve tried other cranberry nut breads, but none has been as good as this one! Try it for breakfast with cream cheese. Preheat oven to 350 degrees. Sift together the dry ingredients. Cut in the shortening until the mixture forms coarse crumbs. Combine the orange juice, orange zest and egg. Make a well in the flour mixture and pour the orange juice mixture in. Stir lightly to combine. Stir in the cranberries and nuts. Spoon into a greased loaf pan and pull the batter away from the center to the four corners (this will keep it from getting too high in the center). Bake at 350 degrees for about an hour, until a toothpick inserted in the center comes out clean.